Apple HomePod, the Frank Abagnale of smart speakers, has been anticipated for a long time now. Although Apple unveiled the $349 speaker at the WWDC in June last year, it is yet to be launched and the company promised it will start shipping the HomePod to customers in the US, UK, and Australia in early 2018. While Amazon and Google might have taken a significant lead over Apple in the smart speaker segment, it appears Apple is planning to change that by offering a simple feature which other have clearly missed. A teardown of the latest Apple Home app reveals Apple may be planning for instances that point at the possibility of muting the always-listening mic on the Apple HomePod. Filipe Espósito pointed out the hidden iconography in the latest build of iOS 11.2.5 beta that indicated the possible features of the upcoming HomePod including the inkling about the launch of the HomePod in near future. 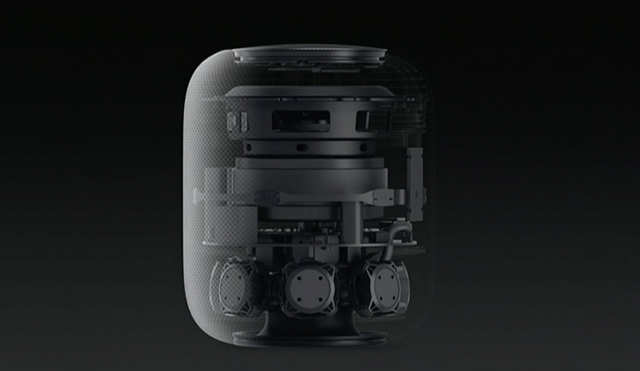 The revealed icons suggest that users can simply customize scenarios when the mic on HomePod will be automatically turned off. The ability to turn the mic off is very important from the point of view of security and privacy as being a wirelessly connected device, it is prone to be attacked and hijacked. Espósito also revealed that the app’s code also contains strings which hint at support for multiple voices, which can be used for personalized results on interaction with Siri. The release of HomePod was pushed from November 2017 to “early 2018” as the Apple sought “a little more time” to perfect the smart speaker. The release isn’t likely to be delayed further as it was reported last week that authorized manufacturer Inventec has shipped the first batch of HomePods to Apple. A couple of days later, documents revealing the HomePod’s FCC approval were published – giving a solid backing to expectations about the smart speaker’s imminent launch.